Shhh! I've got a secret! Ok, so you’ve been to St. John five or six times and you’re an “old pro” at snorkeling. Been to the top tour spots – Francis, Trunk, Maho, Salt Pond and saw lots of fish. Maybe you’ve even taken a day boat snorkel to the Indians and feel pretty smug about giving advice on some of the blogs about best places to go. Well partner, you truly have only experienced places where the masses go and they’ve trampled down the reefs and coral. Above is the “king” of snorkeling within the Virgin Island National Park that no one tells you about. You can see it from Caneel Bay look to the right of the picture above it shows several of the accommodations within Caneel. In the 1940’s and 50’s this piece of land and several other cays in the immediate area was owned by the former Marine Commandant of the Virgin Islands. His son was the first person killed by plane in the vicinity of St. John when the plane he was piloting crashed onto this eleven acre island. The island was then rented to a young couple named Gibney. Who soon purchased beach front property now know as Gibney Beach. There are basically two ways to get to this small island. First, when you hire a boat for the day insist the Captain makes this one of his stops. The second is rent a kayak at Honeymoon Beach and paddle over to the little rock and sand beach. The snorkeling is shallow no more than three to fifteen feet depth. Here you will experience an abundance of fish – expect to see parrot, Angel and Tang with some turtles. The reef is pristine with lots of brain fan coral and sponge. This is what snorkeling was like thirty years ago before all the tourists arrived. Be ready for a truly amazing experience! 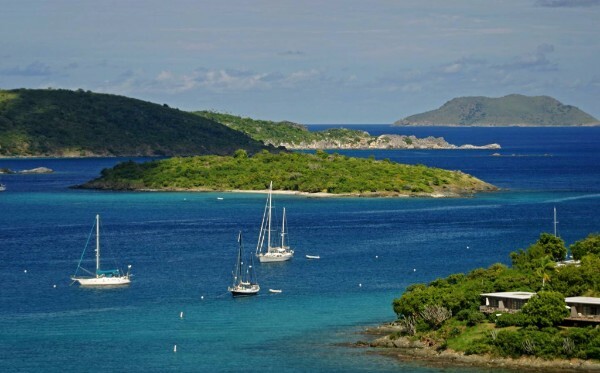 You can see this little piece of heaven from Caneel and it doesn’t look that far, absolutely do not attempt to swim or snorkel in the open water to this cay. If the currents of Durloe Channel don’t sweep you out to sea then definitely some drunken boater in the area will chop you up into small pieces for fish food. Well slow season is upon St. John. This is an absolutely great time to visit. Airfares are down, crowds have pretty much gone home but you’ve got a great opportunity. Water is warm and most villas have deep discounts. For example, commencing mid-August is my “Value Season” and am offering a serious 25% discount for two at both of my villas. There are still have a number of excellent weeks available at both Sopra Mare and Bordo Mare for August and/or September. For the rest of the year, just a reminder as a reader of “Ur St. John Fix” you will receive a 5% discount just tell me. And, of course, returning guests even get a better deal. This is excluding my “Value Season” pricing. Give me an inquiry at: www.mulleysstjohnvillas.com or of course call me at (972) 679-9937. Thank you for putting up with my monthly “psycho babbling.” I also want to take a minute to welcome all the new readers that joined me in July. Hope you like the information provided and maybe it’ll add to your St. John vacation experience. Have a great remaining summer and I’ll “Leave The Lite On For You” at your new island home – Bordo Mare or Sopra Mare. Personally, I’m off to St. John very shortly for sun, Heinie’s (that’s beer you dirty minded person), warm breezes and clear skies. Older PostABOUT TIME FOR ANOTHER BEACH – DONCHA THINK?